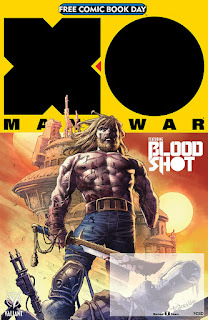 Fangirl Review: Valiant Leads Free Comic Book Day 2017 with the VALIANT: X-O MANOWAR FCBD SPECIAL! Then: comics superstar Jeff Lemire (Inhumans vs. X-Men, Black Hammer) begins the march toward BLOODSHOT SALVATION – a top-secret new series coming in 2017 – with the FIRST APPEARANCEof A MAJOR NEW CHARACTER in AN EXCLUSIVE FCBD STORY that will forever redefine Bloodshot’s place in a violent world of heroes, soldiers, and survivors! Plus: FAITH… HARBINGER RENEGADE… NINJAK… PSI-LORDS… ARCHER & ARMSTRONG... SECRET WEAPONS… RAI... SHADOWMAN… WAR MOTHER... And surprise revelations for HARBINGER WARS 2! Be here on May 6th, 2017 as Valiant’s powerhouse heroes come together to begin their biggest year yet with a stunning series of stories, sneak peaks, teasers, and more – only in the VALIANT: X-O MANOWAR FCBD SPECIAL, featuring brand-new cover art by X-O MANOWAR series launch artist and Valiant-exclusive rising star Tomas Giorello!